Date: 12 September 2013. First Mate. As you would expect, life aboard a coastal cruising boat insures spectacular views, calm and tranquil anchorages, peaceful nights and busy days. What it doesn't guarantee is a friend, and the lack of social interaction can be one of the few down-sides for a soloist life afloat. Fortunately for me, I now have a terrific companion, one who adores me first thing in the morning even before I've had caffeine. Smaller dogs eat less, so I'm not required to store large bags of dog food. Skipper, at 4 pounds 3 ounces, eats 1/4 cup of dry food per day. Smaller quantities eaten, therefore I can afford the pricey better dog food. Better dog food in the pup means less out after processing so to speak. She fits in my purse or dock bag when going ashore. Because she's well-mannered, town folks want to interact with me to get to know her. Skipper is my social secretary. And Skipper just loves to go to land, though I confess we had a problem when she first moved on board. 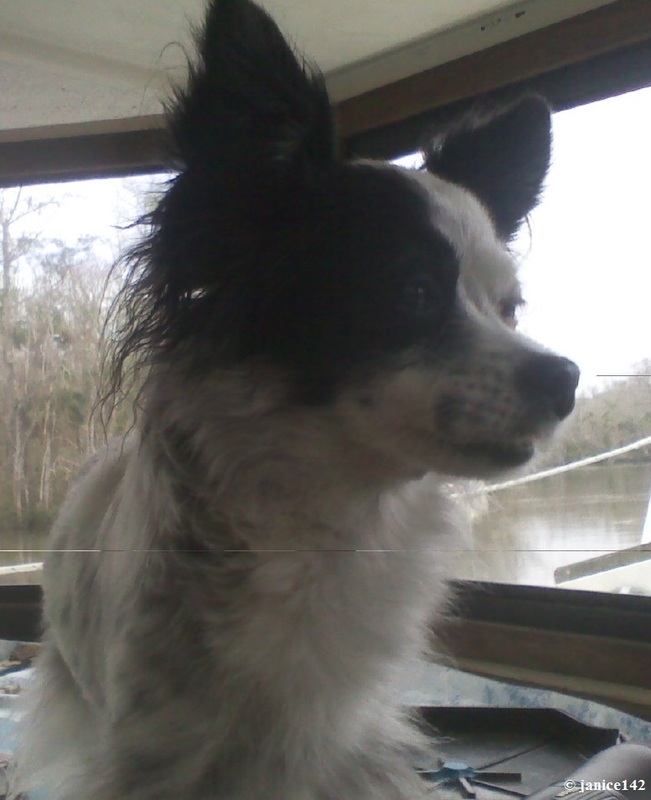 My girl was approximately 2.5 years old and housebroken/boat trained. However, every time she got in the dinghy she thought she was "outside" if you get my drift. We'd get in the rowboat and she's anoint it, which definitely wasn't pleasant from my perspective. To solve that, I put her on the swim platform and would wait until there was a performance. Lots of praise and voila: I have a very smart girl. And no, we would not get into the dinghy until there was action! 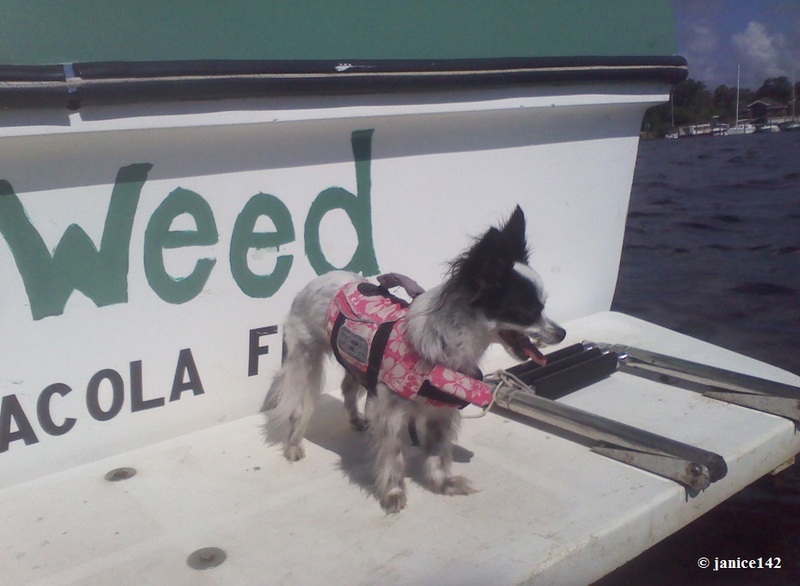 Have I mentioned Skipper loves going for boat rides? Motivation helps, eh? Anyway, a quick rinse of the swim platform and it's all cleaned up though once and a while I have to use the scrub brush and soap. Still and all, to not have to go to shore is such a blessing. Now Skip does like to look at the water so sometimes she goes out and simply enjoys the view. Because I can too, we sit side by side... me dangling my feet in the water and she with her little tummy on the cool fiberglass. Skipper's looking at the water. She does that a lot. And yes, the platform needs a good scrubbing. Tomorrow. My friend Mabel is an amazing fiberglass and gel-coat artist; she built my swim platform from scratch and it's perfect. As she was making it she asked me what sort of design I wanted in the non-skid. "Er, these things have designs?" I thought. Fortunately I couldn't come up with a thing and Mabe made it so the deck looks like the back of a turtle's shell. It's nifty and suits Seaweed to a tee. Thanks Mabe! Do you have a dog? or cat? or something else entirely?! And how did you chose the name of your pet? A favorite aphorism: I hope to be the kind of person my dog thinks I am.